With winding of the first production module for ITER's central solenoid well underway, the US Domestic Agency (US ITER) and its contractor, General Atomics, are now commissioning all of the necessary tooling stations for the 13 Tesla, 1,000-metric-ton electromagnet. 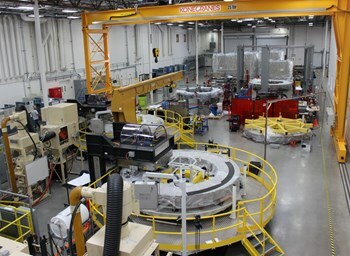 Eleven unique stations will form the module manufacturing line at the GA Magnet Technologies Center in Poway, California. One challenge to commissioning the unique stations is coming up with an appropriate coil that does not use any production conductor. The commissioning process requires a variety of trials to assure that the tooling will perform specific fabrication tasks as predicted. After commissioning, the workstation undergoes a manufacturing readiness review. "General Atomics has been very clever," said US ITER central solenoid systems manager David Everitt. "They made what we call a 'Frankenstein coil' to test and commission numerous stations. This commissioning coil is made out of qualification samples of real conductor which were coupled with other samples such as empty jacket material." The commissioning coil is two layers high with real conductor on a portion of one layer of the coil. "When you see everything that happens at General Atomics every day, you appreciate that they have a very talented crew out there. We have an innovative team who is highly invested in the project," said Everitt. So far, the coil has been used for commissioning activities at stations for joint and terminals preparation, stacking, joining plus helium penetrations, reaction heat treatment and part of turn insulation. All or part of ten of eleven stations are now in place at General Atomics and eight of these stations have completed some or all acceptance testing and commissioning activities. One of the more complex stations to install and commission handles turn insulation. This workstation wraps insulating fiberglass tape and Kapton around the conductor after the coils have been wound and heat treated. In order to wrap the conductor, the coil must be "un-sprung" for insulation wrapping and then reassembled. After insulation is completed, the coils move down the production line to the vacuum pressure impregnation station, where a three-part epoxy mixture is injected under vacuum to impregnate the previously applied turn and ground insulation materials that surround the coil. 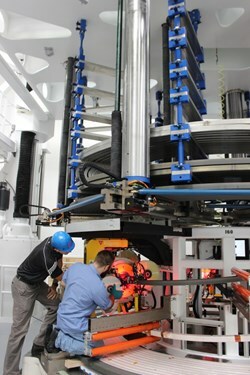 The epoxy provides both electrical insulation and structural support to the 110-metric-ton magnet module. A major investment has been the construction of a cold testing facility for the final testing of each module at 4 Kelvin, comparable to ITER's operating temperature for the central solenoid. Commissioning of the cold testing facility is planned for early 2016, and equipment installation has begun. As the home of the DIII-D National Fusion Facility, General Atomics has a half-century long history with fusion. The Magnet Technologies Center has not only a 4 Kelvin cryogenic system needed for superconducting magnets, but also a large vacuum cryostat for testing magnets, a 50 kA, 10 V power supply, and a fast discharge dump circuit for magnet protection.